What a week! It’s a vacation week at Disneyland as well as my half-marathon! Even though I skip one of my mid-week run, I didn’t feel like I’m slacking off due to many miles of walking I did around the park. The race itself was a lot of fun! It was Disney race after all, so you know that they were going all out to make sure the runners had a great time. 9 weeks down, 19 weeks to go! Drew and I met up after work for a quick run. She took me to a different trail this time, which turn out to be the same trail that I ran every week, it just more east. I didn’t feel too hot as I had cramp and my stomach was giving me all kind of grief but I ran anyway. I kept up with her for the first 20 minutes and I told her to ran without me as I just need to run slower than normal and took more walk break. I finished 3.16 in 40 minutes. Race day! I woke up at 3:30am and was having major abdominal cramp. I was not happy camper and really didn’t want to get up and move. I slowly got up and put my running gear on, ate breakfast and head out. Our hotel located 5 minutes from the start line, which was awesome. I met Kendra, Brent and Ben at the corral. After the usual ‘before race’ photo, and it’s our corral turn to start. First 6 miles went by fast and I was having a great time. I paced myself really well and felt strong. The sun started to rise and it got really warm, really fast. I slowed down a bit due to my cramp and the warm weather, plus it was really, really crowded in some area of the course. Disney always organized an awesome race. There’s a lot of supporter, cast member, cheer leaders and you will get more high-five during this race than you can even imagined! I saw my husband and my girls standing on the bleacher with their signs and cowbell shortly before the finish line. It was SO awesome to see them and my girls was smiling cheek-t0-cheek! 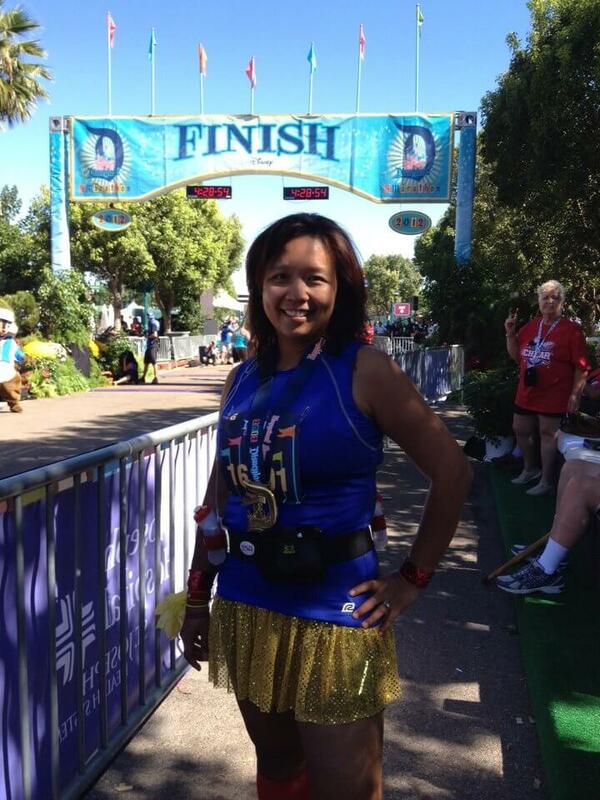 I crossed the finish line shortly after, felt strong and happy. I PR’ed my last half on the same course by12 minutes!! It was an awesome day and absolutely a fun race!